The Great War to end all wars brought immortality to the names of cities, towns and even villages where battles contributed to those unbelievable casualty figures which are being commemorated during the 2014 to 2018 centenary. Whilst the military historians can reel off these names in a long list from Mons to Amiens there are a few names which have become part of every day English language . Of these Ieper or more commonly Ypres must be at the top of the list. The name of this small Belgian town has come to symbolize the destruction, suffering , loss of life and sheer determination not to allow it to fall into enemy hands. Today the town has been rebuilt in its medieval grandeur with the Cloth Hall and St Martin’s church . To these have been added the commemorative St George’s chapel full of tributes to the fallen from relatives and the truly awe inspiring Menin Gate on which panels are etched the names of 54000 soldiers of the British Empire ( except New Zealand and Newfoundland ) who died in the Ypres salient before 17th August 1917. Apparently the panels only contained sufficient space for the names of the missing up to this date. Those missing after this are commemorated on other memorials including that at Tyne Cot. 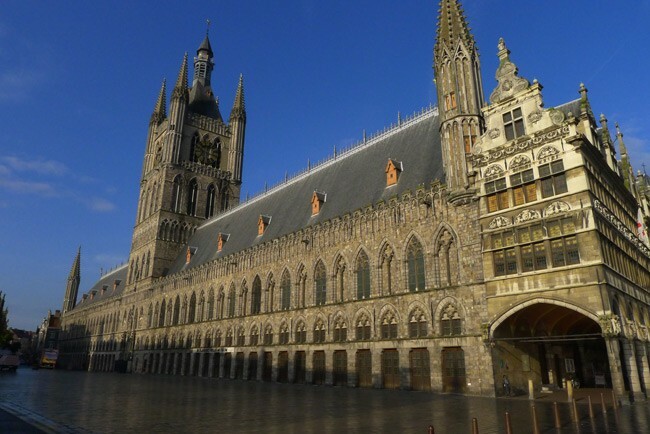 Ypres has become the focal point for modern day pilgrimages to the battlefields of WW1. On any day especially in the summer months , this small town echoes to the sound of hundreds of English speaking voices especially those of British school students who gather nightly at 8pm to hear the evocative sound of the Last Post played as ever by the Fire Brigade buglers under the towering arch of the Menin Gate. (The 30000th playing of The Last Post actually took place on 15th july 2015.) The town together with local nearby villages like Zonnebeke and Zillebeck has museums bringing to life the years of 1914 to 1918 when this small town became the centre of the war on the Western Front. Ypres or Ieper, is a Belgian municipality located in the Flemish province of West Flanders. Though Ieper is the Flemish and the official name, the city's French name, Ypres, is most commonly used in English due to its role in World War I.
Ypres occupied a strategic position during World War I because it stood in the path of Germany's planned sweep across the rest of Belgium and into France from the north , the Schlieffen Plan. The neutrality of Belgium was guaranteed by Britain; Germany's invasion of Belgium brought the British Empire into the war. The German army surrounded the city on three sides, bombarding it throughout much of the war. 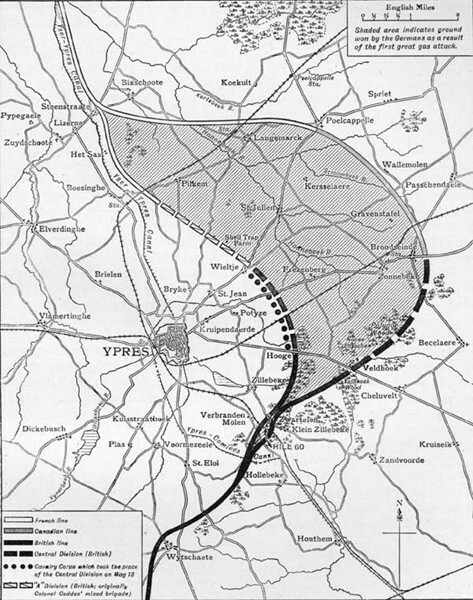 To counterattack, British, French, and allied forces made costly advances from the Ypres Salient into the German lines on the surrounding hills. The first gas attack occurred against Canadian, British, and French soldiers; including both metropolitan French soldiers as well as Senegalese and Algerian tirailleurs (light infantry) from French Africa. The gas used was chlorine. Mustard gas, also called Yperite from the name of this town, was also used for the first time near Ypres, in the autumn of 1917. 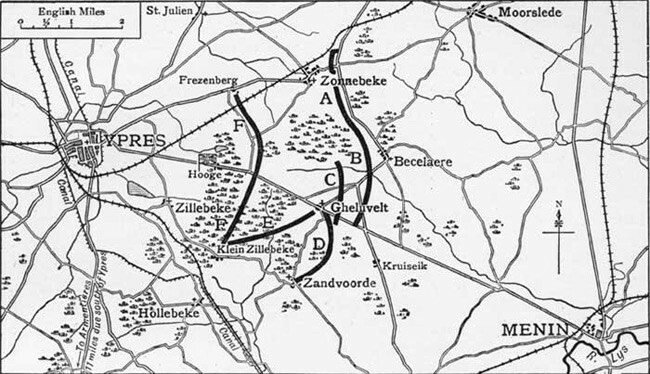 Of the battles, the largest, best-known, and most costly in human suffering was the Third Battle of Ypres (31 July to 6 November 1917, also known as the Battle of Passchendaele), in which the British, Canadian, ANZAC, and French forces recaptured the Passchendaele Ridge east of the city at a terrible cost of lives. During the course of the war the town was all but obliterated by the artillery fire. English-speaking soldiers in the war often referred to Ieper/Ypres by the deliberate mispronunciation Wipers. British soldiers even published a wartime newspaper called the Wipers Times. In this article , I shall endeavor to tell the story of Ypres through the experiences of my relatives who, like many of the B E F, spent some time in and around Wipers between 1915 and 1918. After the initial successes of the Schlieffen Plan in 1914 and the German army being pushed back by a combination of the B E F and the French protecting their capital, there was a rush to the sea and the protection of the channel ports upon which the very existence of the B E F depended.. It was on 7th October 1914 that the first British troops arrived on the outskirts of Ypres as they fell back in the face of a massive German Army . The town is surrounded by a series of ridges which although only about 160 feet high at most provide anyone sitting on them with a total view of the Flanders plain and the town of Ypres. As the situation developed in the autumn of 1914 it was the Germans who occupied the ridges and the allies the town in the hollow. Along these ridges were numerous small agricultural villages whose names are now part of the history of so many British army battalions: Messines, Wytschaete, Hooge, Ploegsteert, St Julien Langemark, Pilkem Ridge , Zillebeck, Zonnebeck and perhaps the most known of them all , Passchendaele. In these places more than one million soldiers died from the effects of the 20th century’s new industrialised war fare. Could anyone of a sane mind have imagined what would happen in and around Ypres over four years? The series of battles from October to November 1914 became officially known as the First Battle of Ypres. The men of the small British regular army fought against all the odds without reinforcements or adequate artillery and in the face of massive shortages of any kind of equipment. It was this that exasperated the Kaiser and resulted in the epithet Contemptible Army which has remained forever with pride. The B E F infantry brigades were assisted by the French ,Belgian and British cavalry brigades fighting without their horses in the trenches with such tenacity that the German High command at some points in the battle with held their attacks fearing a much larger force than was the real case. "They ( the Germans ) could not believe so few men could defy them . They could not believe such rapid speed of rifle fire could possibly be attained. They could not believe that field guns could stay in action and repulse them with a dole of ammunition"
The Germans effectively had 500000 troops in Flanders half of whom were young reservists out of school with only 6 weeks training but still amounting to twice the size of the British, Belgian and French armies combined. On 22nd October 1914, like some scene from a Wagnerian opera, these youthful battalions of Germans are said to have marched arm to arm singing into the volley of fire from the most professional soldiers in the world with 100000 of them falling . This was the Massacre of the Innocents which became part of the folk lore of the German Army in WW1. In spite of these casualties it became more obvious to Sir John French C in C BEF that the size of the enemy forces was much greater than he had initially thought. Fighting in places like Polygon Wood was mediaeval in nature at close quarters using knives and bayonets and resulting in heavy casualties on both sides. Battalions of the Regular British army began to disappear into piled up corpses by the day. Reinforcements did arrive in the form of Indian troops and Territorials but chronic shortages of artillery ammunition made it impossible to launch any effective attacks . The Germans on the other hand received fresh troops and on 29th October launched a huge offensive through the mist overwhelming all of the British advanced positions. With new battalions coming into the Ypres sector the Germans were able to keep up the constant pressure on the depleted BEF and on November 11th 1914 launched a massive offensive along the whole front north and south of Ypres. It failed as the remnants of the Old Contemptibles fired volley after volley into the massed German ranks . This was the end of the German offensive and their attempt to capture the channel ports for the time being. On 11th November 1914 the German Army came to realize that the fighting spirit of the Allies was too great and they gave up attempts to break through. It was the beginning of the Ypres Salient and a four year struggle to break it. One important consequence of the 1914 fighting which was to dominate the story of the Ypres Salient was , the Germans now held the high ground ridges from which they could observe all that the allies did and call upon their artillery to do the damage. The archetypal image of trench warfare began to take shape as the scrape holes in the ground were widened and developed into a trench system although in the Ypres area with its high water table it was necessary to have high walls of sand bags at the front and back to provide some protection from the artillery. Life in the trench system began to settle down to a series of activities like trench repairing, burying the dead, fetching supplies from the rear and the much hated nightly trench raids. Time in the front line was followed by time in reserve and rest and recuperation with hot baths and estaminets and in large towns the prospect of a visit to the red light district . In Ypres it even had its own satirical newspaper the WIPER’ S Times in which soldiers of all ranks could make a contribution and enjoy a laugh at the most bizarre and in some instances macabre events. I had no relatives in the 7 Regular Divisions that made up the original B E F. Whilst this fight for survival was going on those of my relatives who had answered the call to arms in 1914 were still in the UK at various training camps waiting to go over to France. For some their war would come all too quickly. With the Germans transferring men to the Eastern Front and turning their trench systems on the higher ground into defensive fortresses, no big battles took place until the spring of 1915 . The allies had to endure the German’s artillery advantage and the casualties mounted, the cemeteries grew and the town of Ypres with its ancient spires much admired by pre war tourists was turned into mounds of bricks and rubble as its population decided to leave for safer parts like Poperinge. As I write this in December 2014 with Christmas approaching , it is worth reflecting upon the oft held myth that people on both sides thought that the war would be over by Christmas 1914. The powers that be obviously did not for much effort went into arranging for the soldiers in the trenches to receive Christmas gifts from the King and the Kaiser. Some of these were even exchanged between adversaries during what became known as the Christmas Truce. We know from contemporary diaries that in some sectors of the front including around Ypres hostilities ceased during Christmas Day 1914 and that groups of men climbed out of the opposing trenches to exchange hand shakes and gifts and a few appropriate words. Whilst myths have been developed about football matches and operatic performances in the French film JOYEUX NOEL some fraternisation did happen at Christmas1914 but there was to be no repetition in later years. From 1915 the war assumed a different character. Bitterness ensued on both sides as the slaughter grew and the use of more anonymous weapons of destruction engulfed the element of human contact between the sides. 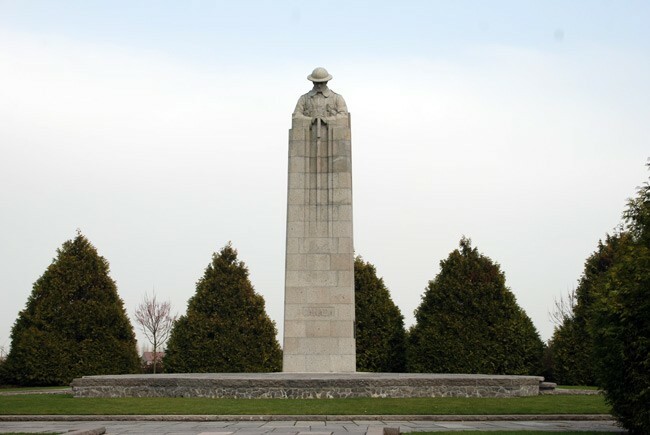 The army of Old Contemptibles was being reinforced by Territorial battalions and Empire troops notably the Canadians who were to have a significant involvement in the future battles of Ypres and whose memory is much remembered by the memorials dotted about the modern Ypres landscape. The Germans could not break through and sacrificed men who might have been sent to the Eastern front whilst the British just did not have the manpower to mount any really effective attacks. The war had turned into a stalemate . The allied line had shrunk closer to Ypres and the German’s occupied even more of the high ground around the beleaguered town. There were two of my relatives who were in the Ypres Salient during the Second Battle of Ypres and therefore must have experienced these horrors of the constant shelling of the trenches but thankfully no gas. My maternal grandfather was George Mason Maltby born in Cambridge in 1899 into a large family with older brothers and many cousins all residing in that academic city in the Fens. One brother was Samuel J Maltby born in 1890 and employed as a Bill Poster with the New Theatre Company . 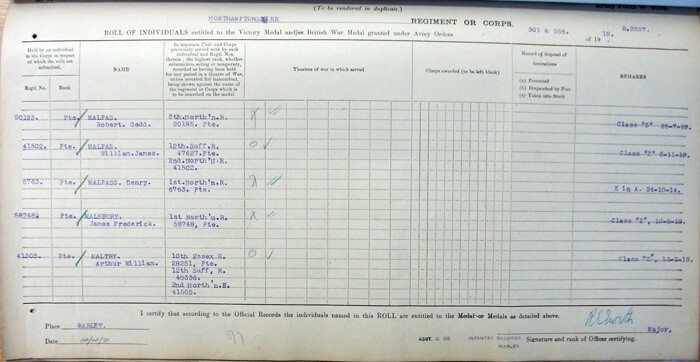 Unlike so many others , Samuel’s army service records still exist and show that he joined as a Special Reservist on 19th February 1914 in the 3rd Battalion the Suffolk Regiment . He was called up on 8th August 1914 and posted to the 1st Battalion Suffolk regiment based at Bury St Edmunds going with them to France from Southampton on 23rd February 1915 as Private 3/8912. After a period of training and acclimatization he joined his battalion on 4th March at Balleuil before transferring to trenches around Ploegsteert and then Kemmel. The War Diary for the 1st Bn details the movements in and out of the front line that was to become the norm for the soldiers of WW1. March 8th Battalion arrived at BAILLEUL & went into billets. 6 15 AM arrived BAILLEUL & went into billets. DRANOUTRE ROAD arriving there at 4 30 pm. Lt General Smith Dorien in a field near to LOCRE. On 12th April Samuel and his unit moved to Poperinghe the base town full of supply dumps, hospitals and entertainment areas soon to include the famous Toc H house founded by the Reverend Tubby Clayton in December 1915. On the way they passed through the small village of Westoutre where were billeted the 2nd Battalion Suffolks. It was the first time that the two battalions had been together in one place during war time. 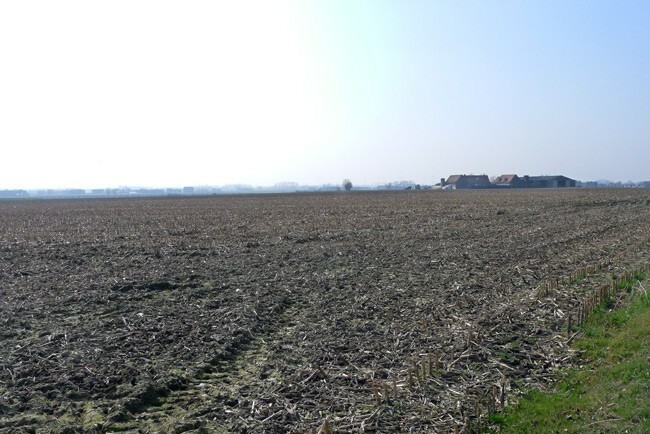 From here the 1st Bn moved into the front line at Zonnebeck where other units of the 28th Division were waiting to be involved in a big action soon to become the Second Battle of Ypres. Here the opposing trenches were very close less than 10 yards in some instances so that there was a constant exchange of bombs and trench mortars. Strangely, there are no entries in the War Diary WO95/2277 for the period 10th to 30th April 1915 although the Regimental History by C C R Murphy tells us what happened during the period in late April and the Second Battle of Ypres. On 15th April the 1st Suffolks went into the front line at Zonnebeck and on 21st they and 1st Welsh put up a rapid fire barrage for 3 hours against German trenches yards apart and with large supplies of bombs , grenades and trench mortars. It was on 22nd April that the Germans used gas for the first time and broke through the allied lines. On 24th April, the 1st Bn Suffolks went back to brigade reserve behind the front lines but soon had to move quickly North to reinforce the Canadians who had been badly affected by the gas. The Suffolks spent all night digging a fire trench at which point Samuel Maltby’s war came to a temporary end. His medical records show that he sprained his ankle so badly that he was sent off to base hospitals at Boulogne and then Rouen before on 29th April he went back to the UK. However , this was not the end of his military service for , his medal index card shows that as well as serving in the Suffolks he also served with the Norfolk Regiment as Private 20002 in Mesopotamia before being invalided out of the army in November 1916 and receiving the Silver War Badge number 104979. At the very same time that Samuel J Maltby of 41 Norfolk Street Cambridge was in the Ypres Salient with the 28th Division , his cousin William Robert Maltby of 49 Beche Road Cambridge was with A company 1st Battalion the Cambridgeshire Regiment in the 27th Division. 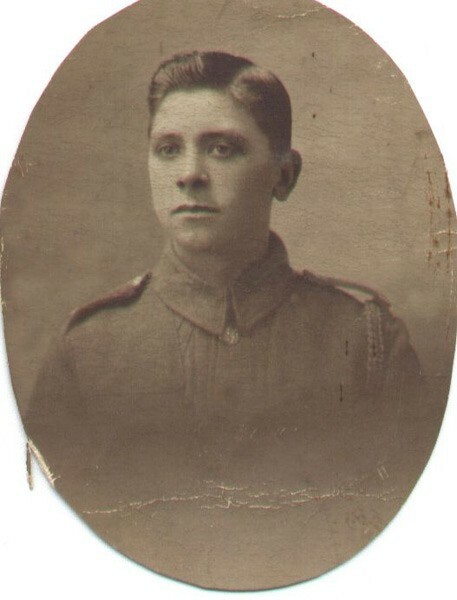 William was born in 1896 and joined the Territorials on 7th January 1914. He was mobilised on 5th August and sent to France on 14th February 1915 as Private 1835 a teenage Tommy. The 1st Battalion war diary WO95/2266 again provides details of the units movements in and out of the trenches and their involvement on the periphery of the Second Ypres Battle. 1.3.15 The question of defective rifles in the Bn. Several of those fired at TERDEGHEM failed to fire. 2.4.15 Bn paraded and marched to Ypres. HQ in Sanctuary Wood. 19.4.15 Hill 60 captured by 5th Division. This caused tremendous bombardment with shells going over us all night. 23.4.15 Rumours of fighting going badly for us in the North. Bde reserve with orders to hold the subsiding line in the event of the Bde withdrawing to the second line. 24.4.15 It transpired that we were in a very desperate situation the French having given way and the Canadian Division having been badly knocked about. 25.4.15 HQ and C Coy less one platoon proceeded to Sanctuary Wood shortly followed by A Company. 29.4.15 Rumours of a shortening of the line and consequent reduction in the dangerous salient held by the 27th Division . Active preparation for withdrawal in progress. All possible trench stores conveyed to Sanctuary Wood. 3.5.15 Retirement took place by night to Maple Copse. 4.5.15 No dugouts in Maple Copse so men slept out until dawn when they started on construction of dug outs. 7.5.15 HQ and A coy to Brigade HQ at Ypres. Shelling around a school several hit. Rations taken to Duke of Cornwall’s Light Infantry. D coy to No 2 and 3 trenches .B coy to No 11 and 12 trenches. Relieving Royal Irish Fusilers. 8.5.15 A coy and C coy on standby to meet an attack. A coy fall in at noon to take rations to Sanctuary Wood. 9.5.15 A coy . Germans fired trench mortars into trenches 11 and 12. The last entry is the action during which William Maltby became a casualty and brought his war to an end only three months after he had landed in France. 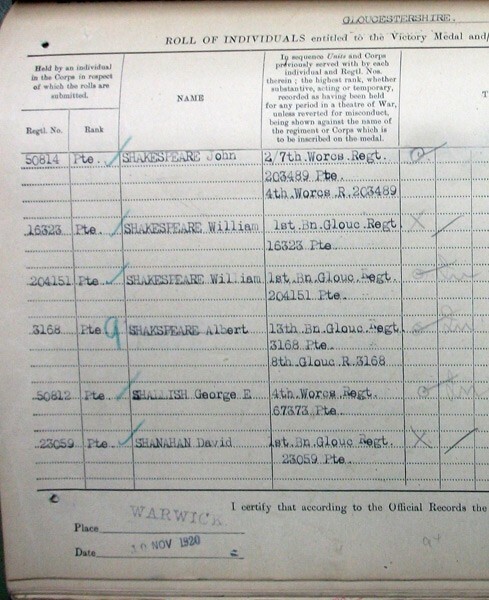 His Army service records still being in tact tell us what happened to him on 9th May 1915 and subsequently. 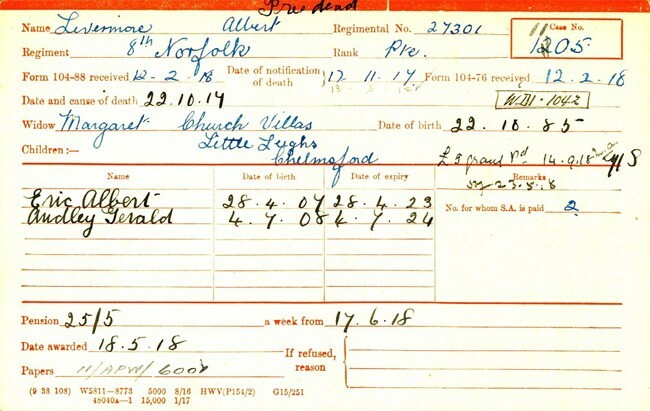 The Casualty Form ‘Active service’ confirms that on 9th May 1915 he was wounded in action near to Ypres. He was initially treated by the 81st Field Ambulance attached to the 27th Division. Each Division had 3 such Field Ambulances which was a front line medical unit providing a Walking Wounded Collecting station. On 10th May 1915 he was sent to the No 1 Canadian Stationary Hospital which had been located at Wimereux, North of Boulogne between March and July 1915 . His wound was a ‘Blighty One’ for, on 11th May 1915, he was transferred to 2nd Eastern General Hospital in Brighton, which operated from a number of school buildings, including the local Grammar school. From the report of the Medical Board dated 24th June 1916 it appears that at Ypres he was struck by a piece of shrapnel on the inner side of the left forearm. After an operation, his wrist could be flexed but not extended and fingers could be extended but could not be voluntarily flexed. As a consequence of this, he was passed unfit for any kind of Army service and was discharged from the army on 20th July 1916 at the Shoreham Depot with a pension and the SWB no 33746 at the age of only 19. In the Cambridge Chronicle of 4th June 1915 and 14th August 1915 William Maltby appears in the list of 1st Cambridge casualties together with a photograph of a fresh faced young man (see Figure 5) who had now become disabled as the result of the war. He had a pension, which was reviewed annually and in 1920, he received the Pip, Squeak and Wilfred medals to commemorate his very brief time in the Second Battle of Ypres. Both of the Maltby boys had spent time in Sanctuary Wood which like so many other woods across the Western Front gained a notorious reputation during the war. Today in a part of the wood there are old trenches to be seen together with a museum full of original artifacts some of which give a rather gruesome impression of this 20th century industrialised warfare. 1915 saw a series of British attacks all of which were really ineffective due to poor tactics and a dearth of artillery support. In addition it saw an attempt to win the war through another channel namely Gallipoli where again the tactics were poor and the enemy, the Turk, much underestimated . On the Western Front the war of attrition continued on a diminished scale but nevertheless occupied thousands of troops. Ypres continued to be shelled and destroyed whilst the B E F soldiers in and around the town lived the lives of troglodytes buried in dugouts and basements around the town’s walls and in the trenches within the Salient all the time overlooked by the enemy. The weather in winter brought rain frost and snow turning the trenches into muddy rivers which then became baked hard in the summer. By 1916 Douglas Haig had taken over from Sir John French as the C in C BEF and he favoured further attacks at Ypres to protect the channel ports and to push the Germans out of the Belgian ports which were being used by their U boats. However , the French were demanding more action from the British but not in Belgium. At a conference in Chantilly in December 1915 the French won the argument and agreement was reached for a joint Anglo French attack in the area of the Somme River a quiet spot since 1914. 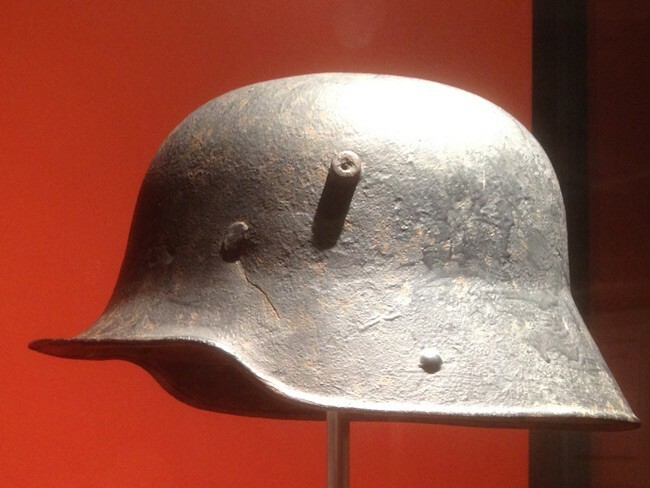 The Germans preempted the allies when in February 1916 they launched a massive attack on the French fortress town of Verdun in an attempt to bleed the French army white and force them to bargain for an armistice. To gain some respite from this the French pressurised Haig into the Somme offensive much earlier than he had intended and before the New Armies were adequately trained. So it was that 1916 was taken up with the Battle of the Somme its preparation and execution which laboured grimly on until November 1916. Haig had lost enthusiasm well before the end and his mind moved to the Ypres salient. However , even at the beginning of 1917 Haig could not devote his energy or his resources to another Ypres campaign . The French had their own ideas for an attack in the Champagne region and they had a new military leader in General Nivelle to carry it forward. . They needed the British to undertake a diversionary battle to tie down the Germans and to allow the French a free hand on the Chemin des Dames. Thus it was that Haig reluctantly agreed to and undertook the Battle of Arras between April and May 1917. After an amazing initial success Arras dragged on with massive casualties and with Haig loosing interest . It was not until the summer of 1917 that Ypres again became the centre of the Western Front. The French attack on the Chemin des Dames was an horrific failure with mass casualties that broke the back of the French infantry soldiers, les Poilus . The result was Nivelle was replaced by Petain and mutinies occurred up and down the French line which although dealt with severely resulted in the French Army effectively becoming a defensive force only. The classic Hollywood film PATHS OF GLORY with Kirk Douglas depicts the situation in 1917. Morale would take along time to recover and thus the British would have to bear the brunt of any attacking. Haig formulated his plans for a major operation in the Ypres sector to commence before the German’s realized how weak the French really were. "In early 1916 Plumer summoned the tunneling companies and told them of a scheme of unprecedented magnitude. They were to dig twenty one deep mine shafts beneath the ridge ( Messines Ridge ) some of them half a mile long and fill them with an amount of explosives so far unheard of . The work involved in this was mind boggling thousands of miners tunneling night and day with tons of soil to be disposed of and all of it done in the utmost secret. If nothing else Plumer thought big he intended to blow the entire Messines Ridge off the face of the earth with millions of pounds of ammonal." 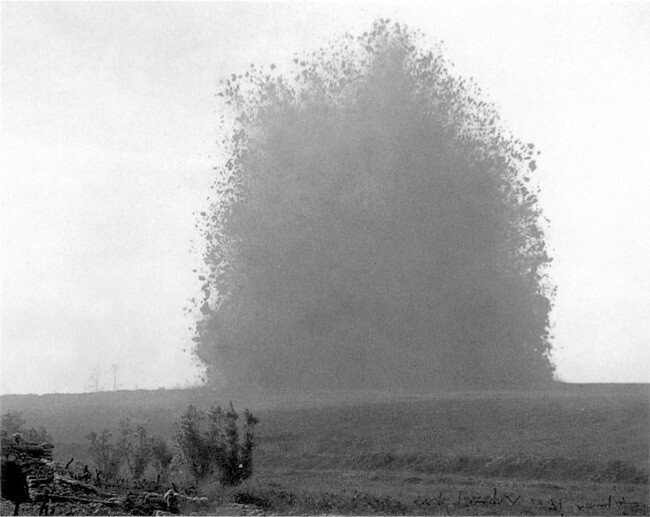 Ammonal had been used for the first time in July 1915 to mine the old Hooge Chateau instead of gunpowder because it was lighter and more powerful . Anyone wishing to appreciate the appalling conditions in which these miners and members of the Royal Engineers tunneling companies worked and the dangers they faced should read Sebastian Faulks’ BIRD SONG and watch the Australian made film BENEATH HILL 60 . 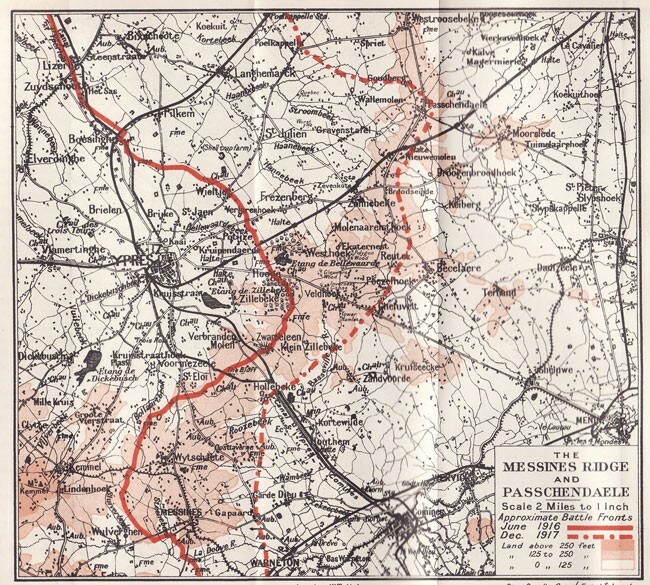 The big show at Messines was to be the prelude to Haig’s Ypres campaign of 1917. By the spring of 1917 after months of digging involving 20000 tunnelers the tunnels were as ready as they could be. The work had been arduous and very dangerous. The Germans had not just sat there and allowed it to happen under them. They too burrowed away hoping to find the British tunnels and blow them up which in some instances they did . It was indeed an underground war with hand to hand combat occurring when sometimes each side broke into the others tunnels. In such cases the implements used for digging were used as the weapons . Again the reader can see this in a scene from the BBC’s adaptation of BIRD SONG . So in May , the preliminary bombardment upon the Messines ridge commenced with 4 million shells and 15 million rounds of machine gun bullets falling upon the German lines in such intensity that no food supplies could get through . The German nerves had been strained to breaking point when on 7th June at 3 10 am the biggest explosion the world had ever seen and heard blew 10000 German soldiers to kingdom come as 80000 British and Empire troops from everywhere on the globe got out of their trenches and moved up the Messines Ridge in the most successful allied attack of the war to that date. Strangely 21 mines had been prepared but only 19 were triggered leaving two fully charged under the Belgium farm land waiting for something to happen. One did blow up in an electrical storm in the 1950s but the other lies there still. "Suddenly great leaping streams of orange flame shot upwards each a whole volcano in itself, as along the front of attack ,followed by terrific explosions and dense masses of smoke and dust , which stood like great pillars towering into the sky, all illuminated by the fires below." In case anyone had survived the mines, the artillery set up a huge creeping barrage followed by the allied soldiers . Whilst, there was some resistance from the German machine guns in their nests behind their front line , the BEF men reached the top of the Ridge by 9 am . The Germans gathered troops for a counter attack but they were destroyed by pin point artillery fire . The Battle was over by 11am, the British held the important high ground and the casualties of 25000 considerably less than expected. It was a great success and opened the path for Haig’s master plan to drive the Germans off the high ground and out of the Belgian ports. However, strangely after this great success there was a delay born of confusion and indecision about what to do next. The Third Battle of Ypres did not commence until 31st July 1917. And so it came to pass that after unexplained delays and confusion as to which General was to undertake the break out , the preparations to push the Germans off the ridges began in July 1917. Haig assembled 500000 men to do the job that he had been planning since 1915 to push the Germans off the Gheluvelt Plateau and the Passchendaele ridge and out of the Belgian coastal ports of Ostend and Zeebrugge. Haig had a major problem in convincing Lloyd George that this would work. Lloyd George and others were supporters of the view that the war could not be won on the Western Front. In late 1917 he preferred to send men and artillery to support the Italians . It was only when Navy chiefs told him that the U boat menace was close to starving Britain that he agreed to Haig’s Flanders plan which included driving the Germans out of their U boat bases on the coast. However, the Germans had wind of the coastal plan and in July 1917 they launched the deadly mustard gas against the British north of Ypres with such devastating results that the attack on the coastal ports was impossible. Yet, the Third Battle of Ypres did go ahead with an enormous barrage coinciding with an abnormally wet spell of weather. The results of these combined forces was the destruction of the ground over which the infantry and tanks were supposed to attack. So at 3 50 am on July 31st 1917 the battle that the world would come to know as Passchendaele began. The initial assault got totally bogged down in the Flanders mud. One of my relatives Wilfred Livermore of 112th MGC was involved in providing supporting fire to the infantry on 31st July after his 37th Division had moved from Arras to the Ypres sector around Kemmel. 31.7.17 Barrage opened at 3 50 am covering advance of infantry . During day 200000 rounds were fired. Further assaults in the Ypres salient during August 1917 also failed in their objectives . The incessant rain was an enemy that neither side could beat. Another of my relatives Frank Jarvis found himself pitched into this battle of the elements. Frank had been wounded at Arras in April 1917 fighting with 7th Bn Border Regiment. After hospitalisation and recuperation in the UK he was sent back to France to join the 6th Bn Borders who were at St Julien in August 1917 when they received a draft of 153 other ranks. This was in preparation for their involvement in another element of the Third Ypres to be known as the Battle of Langemarck. On 22nd August at 4.45 am the barrage commenced and after 42 minutes it moved forward followed by C and D companies of 6th Borderers. In spite of intense enemy machine gun and artillery fire they achieved their objective and consolidated it so that on the night of 24/25th August they were relieved by the South Staffords. The remainder of 1917 was spent in and out of the front line in the Ypres sector though fortunately for them not at Passchendaele. The War Diary WO95/1817 of 6th Borders provides us with the details of their involvement. At about 8 pm instructions were received that C & D coys should advance their front line 300yds in conjunction with operations on the right. All arrangements were made and orders issued. Zero hour to be 4 45 am next morning . 22nd 4 am men were all ready waiting for zero. 4 45 Zero. At zero plus 42 minutes the barrage moved forward and in accordance with instructions C & D Coys moved forward behind the barrage to the objective. The enemy were outnumbered but their artillery and MG fire were very heavy. When the objective was reached consolidation took place and all the men were under cover. 24th on the night of 24/25th the Bn was relieved by 7th Bn South Staffordshires. Bn marched back to CANAL BANK and billeted in dug outs . 27th at 2 30 am B coy moved up into the front line to support battalion holding front line in the event of counter attack . A C & D Coys were used as carrying parties. At 10pm B Coy relieved and marched back to CANAL BANK. With no major successes to show for a month’s fighting Haig blamed Gough and his 5th Army and sacked him bringing back Plumer and the 2nd Army which had had the major success at Messines. Haig now realized that the big break out from the Ypres salient was not going to happen and that it had again become a battle of attrition just what Lloyd George had feared. Haig needed reinforcement and there were thousands of young conscripts waiting in the UK training camps. Lloyd George refused the repeated requests. So the battle dragged on into the autumn of 1917 with a series of attacks the names of which are found on the battalion flags of many current British Army regiments; Pilkem Ridge, Langemarck, Menin Road, Polygon Wood, Poelcappelle, and Passchendaele itself. In September , the Menin Road assault backed up by a huge barrage proved very successful followed by Polygon Wood which , although successful cost huge numbers of casualties. The British took the Gheluvelt Plateau and Haig pressed Plumer to go even further to take the Passchendaele Ridge. Was this a Ridge Too Far, for masses of German reserves were being brought up and the rain returned to add mud to the defences.? Frank Jarvis and his 6th Bn Borders were again in action to the North of Ypres . October 2nd 1917 fighting kit was issued to the men and all arrangements made for the Bn going into action. 4th at 1 am a hot meal was served to the men and at 2 am A B C & D Coys moved forward towards the line. A & B coys moved up and dug in between the STEENBEKE and the LANGEMARK –WINNEPEG road. At 6 am the attack commenced. The role of the Bn was to support the two Bns of the Bde in the attack and to recounter any successful counter attacks. 9 40 am the four Coys were in formation for immediate counterattack on receipt of instructions from the commanding officer. Throughout the morning the position around PHEASANT FARM was shelled heavily and in spite of the fact that the men were spread out into small groups heavy casualties were inflicted. About noon orders came that the Bn would probably go through the 9th Sherwood Foresters and 7th South Staffords. All arrangements made and order received for the attack. A B C & D Coys were to attack on the whole Bde front with three platoons in the first wave and I platoon in reserve. About 4 pm owing to the fact that the Division on the immediate left of the Bde front had fallen back about 500 yds orders for our attack had to be cancelled . At 8 30 pm Coys moved forward B Coy taking over the left front and D Coy the right front . C Coy took over the support line with A Coy in reserve. 8th October On being relieved Coys marched back to CANAL BANK and from there conveyed in lorries to SIEGE CAMP. 31st October NOEX LES MINES Bn in hutments cleaning up and reorganizing bathing and inspections . This was Frank Jarvis’ last visit to the Ypres sector and effectively the end of 6th Bn Border regiment’s war for in February 1918 it was disbanded and the men transferred to their 11th Bn . On October 9th the Battle of Poelcappelle was launched but again no major advances due to the German artillery being able to fire from their elevated positions on the ridge and the sea of mud that sucked everything into it including the tanks which could not cope with the conditions. The 29th Infantry Division was involved in the opening of the Poelcapelle offensive part of this Division was the 4th Bn Worcestershire Regiment . My paternal grand mother’s brother George Shallish had been conscripted in early 1917 into the 4th Bn and had survived their involvement in the Arras action. The Worcesters were in the front line trenches North of Langermarck on 8th October 1917 ready for the attack at zero hour 5 20 am on 9th. The rain had been extremely heavy and it took hours for the attacking troops to line up on the tapes which had been laid out .The Battalion War Diary WO95/2309 describes their part in the Poelcappelle action. TRENCHES moving at a rate of 100 yds in 6 mins. 10 mins after zero and very heavy . This appears to have been George Shallish’s only action during the Third Battle of Ypres as he and the 4th Worcesters moved south and prepared for the Battle of Cambrai . Another of my relatives Albert Livermore found himself in the Ypres battle in October 1917. He had been called up at the age of 31 in January 1917 and although his medal index card shows him to have been in the 8th Bn Norfolk regiment part of the famous 18th Division , the Norfolk regiment museum told me that he had been in a tunneling company until the end of September 1917 when he became an infantry man. A synopsis of the 18th Division’s action on 22nd October 1917 shows that it was indeed successful. The 53rd Brigade of 18th Division attacked Poelcappelle at 5 35am with the 8th Norfolks in the lead followed by the 10th Essex. A chinese attack using dummy figures was launched at the same time to distract the Germans’ attention from the imminent attack on the brewery.The Norfolks took the Brewery as planned and the Essex advancing at 7 30 am passed through the Norfolks and went onto take Noble’s farm. They pushed onto Meunier House which also fell. The War Diary of 8th Bn Norfolks WO95/2040 gives a very detailed account of what happened before and during 22 October 1917 around Poelcappelle. Paper strength of the Battalion on 30th September 1917 44 officers 999 other ranks . 14 Officers 92 Other ranks. Battalion remained in dugouts along the Canal Bank throughout this period . Instructions for move and taking over the line on the night 14/15th issued verbally to company commanderers. 14th Battalion left billets along the canal bank at 1 30 pm for the line. Ground was very wet and muddy which made going rather difficult . 17th Battalion left CANE TRENCH at about 10 am . Bn entrained at 10 30 am train arrived at POPERINGHE at about 2 30 pm . Battalion marched to TUNNELING CAMP arriving at about 3 30 pm. Order issued for part to be taken by the battalion in the POELCAPPELLE operations. SHORT NARRATIVE OF THE PART PLAYED BY THE 8TH BATTALION NORFOLK REGIMENT DURING THE POELCAPPELLE OPERATIONS ON 22ND OCTOBER 1917. The barrage of the Division on our left commenced 3 minutes before Zero but punctually at 5 35 am when it was still dusk and with rain still falling our barrage opened. The half light of dawn and the ground mist made it impossible for our men to see more than 200 yards in front of them. Our men advanced with the barrage keeping in close touch with it as it lifted. Our left company B advancing well behind the barrage met with some slight opposition at REQUETE FARM ; this opposition was rapidly dealt with and the company pushed on . The company pushed onto HELLES HOUSE and met with considerable opposition from two light machine guns and a party of enemy bombers. This second obstacle was soon successfully overcome by our men. Throughout the advance a certain amount of opposition was met from occupied pill boxes but so close did our men follow their barrage that they had surrounded these before many of the enemy had time to get out of them and the occupants were either killed or captured whilst still inside. Mopping up was carried out expeditiously and when the final objective was reached posts were pushed forward to clear the way for and give assistance to the 10th Bn Essex Regiment which was to pass through and capture a further objective. The battalion was relieved on same night by the 12th Bn Middlesex regiment. This action by the 53rd Brigade was one of the major gains won by the BEF in 1917 although there were casualties with 30 men missing one of whom was Private 27301 Albert Livermore. It took almost a year before his widow was told officially that he had died at Poelcappelle on 22 October 1917. It appears that he was killed by a shell in the assembly trench before the action even took place. He is now buried in Cement House CWGC near to the location of the action . Australians and New Zealanders were now thrown into the battle which both Plumer and Gough were having major doubts about.. They failed bravely and Haig called upon the Canadians the victors of Vimy Ridge in April 1917 . Their involvement in the final weeks of the Third Ypres is graphically depicted in Paul Gross’s award winning film PASSCHENDAELE. On 26th October the Canadians attacked in a leap frog formation using all 4 infantry divisions at General Arthur Currie’s disposal. They made progress but at a great cost which they were to question long after the war had ended. Fighting tenaciously against an enemy that had far from lost its morale, the Canadians took the Passchendaele Ridge on 6th November 1917 more than 3 months after the battle had begun. The year 1917 came to an end . 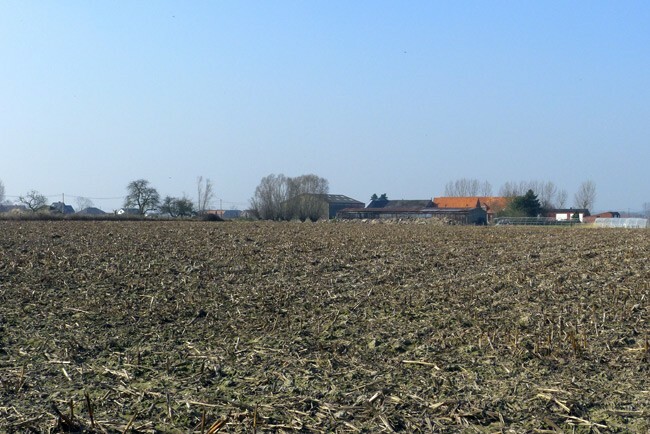 Haig had achieved his objective by taking the ridges and pushing out the salient but at such a cost in lives that the name of this small village reduced to a pile of rubble has forever become associated with the mud and casualty statistics of the Western Front. None of my 8 relatives was involved in the horrifying final days of Third Ypres. That dubious honour fell upon the shoulders of the indomitable warriors from the dominions of Australia, New Zealand and Canada whose dead have their names etched in stone upon the memorials across the Ypres salient most notably the Menin Gate and Tyne Cot. There is still an argument about the casualty figures for the 1917 Flanders campaign with 350000 allied versus 335000 German as conservative estimates. 1917 did not end with the mud and slaughter of Passchendaele because Haig launched an attack at Cambrai which was to be a practice run for the tactical battles of 1918. Tanks were used in number and brought initially great gains with German units fleeing before them and surrendering in huge numbers. However, as with so many other situations in WW1 the attackers paused and the defenders regrouped brought in reserves and counter attacked which effectively nullified the original BEF gains. Nonetheless, Cambrai showed what could be done by combined operations involving tanks, infantry and aircraft. It was a lesson well learned by the BEF commanders who adapted it for the open warfare of the Last 100 Days. My mother’s father George Maltby like others in his Cambridge family came under the colours in 1917 . Having been in the 18th Training Regiment he was drafted to a famous regiment , 1st Bn Royal West Surrey, The Queens , one of the oldest regiments in the British Army . As part of the 33rd Division ,they had been involved in Third Ypres at the Menin Road and Polygon Wood Battles although I think that my grandfather arrived in the Ypres salient in October 1917 after the battalion had been involved in repelling a significant German attack on 24th and 25th September. At this time they were encamped at Neuve Eglise south of Messines. The War Diary WO95/ 2430 available online from the Regimental Museum in typed format, is one of the most comprehensive that I have read to date. It shows in great detail their involvement in the post Passchendaele operations in which hostilities continued on a diminished scale and how the troops were moved about the Ypres salient very frequently. Following received from General PLUMER . Please accept my congratulations on success of to-days operations and convey them to the troops engaged. The 33rd Division have done fine work under extraordinarily difficult circumstances. Battalion paraded at 10am in drill order and marched to SERQUES where the Brigade was drawn up in three sides of a square . The C in C field marshal sir Douglas Haig arrived at 11 40 am and was received with a general salute . The Commanding Officer was personally complimented by the C in C on the splendid turnout of the battalion and its steadiness under arms. The battalion was disposed with three companies A B D in trenches at BETHLEHEM FARM. The day was spent in providing fatigue parties to the RE . Fatigue parties comprising 5 officers and 230 ORs were furnished at various times in the proximity of MESSINES upon tracks etc. Working parties of 4 officers and 200 ORs furnished. Football was played in the afternoon. A selected platoon of A company practiced an operation by day and night with a view to a raid taking place during our next tour in the Front Line. 2 15 am Party of 43ORs and two officers carried raid on enemy’s lines with the object of obtaining identification and inflicting loss on the enemy . Raid successful prisoner taken. Battalion at ½ hours notice to move to support of the Advanced Brigade. Continued in front line which consisted of posts requiring much work which was commenced immediately on taking over. No movement possible by day . On relief battalion marched to POTIJZE AREA. On arrival hot water was in readiness. All ranks had foot baths after which prevention of trench foot treatment was carried out. Detrained at BRANDOEK marched to TORONTO CAMP . Brigade now in Divisional Reserve. The major fighting may indeed have diminished into 1918 but both sides continued to engage in trench raids to disrupt life and make sure that nobody became too complacent. At about 1 30 am a German fighting patrol numbering 12 to 15 men which had secreted itself near one of the advanced posts of D Coy rushed the listening post consisting of two men who were posted about 20 yards in front of the post overpowering and gagging them but not before the two men had given the alarm to the post. The later immediately opened Lewis gun fire on the Germans who were dragging away the two men of the listening post Ptes Purdie and Henson . The fire caused casualties in the patrol and Pte Purdie by dealing a blow with his fist knocked out one of the Germans who was left with him and escaped. A patrol which went out later discovered the bodies of 7 of the Germans and there is no doubt that further casualties were caused. 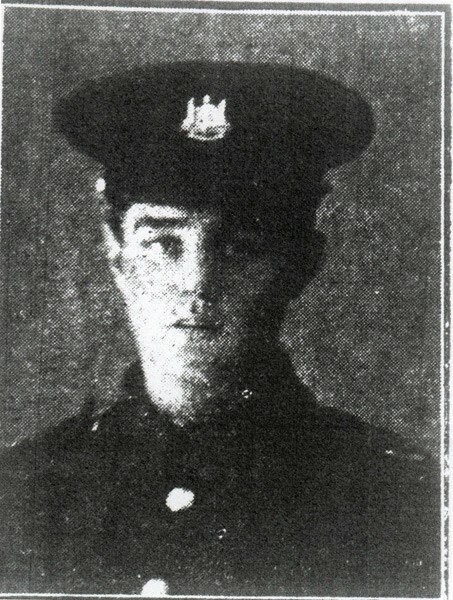 Pte Henson was reported Missing after the action. So, 1918 arrived and any thought of an allied victory seemed a distant dream . People in high places were even saying that the war would go on into the new decade. Haig was suffering a significant shortage of men after the costly campaigns of 1917. Lloyd George made the situation worse by sending Plumer and several divisions to Italy where he thought they could help to beat the Austrians out of the war. The exact opposite happened with the British and French fighting desperately to keep the Italians in the war and losing men including Vera Brittain’s brother Edward as shown in the moving film TESTAMENT OF YOUTH . Furthermore, the capitulation of the Russian peasant army and the overthrow of the autocratic Romanov dynasty released vast numbers of German troops onto the Western Front . This enabled Eric Ludendorff to launch his great offensives designed to throw the BEF back into the sea and force the French to sue for peace. This was his great chance before the Americans arrived in such numbers to tip the balance of manpower in favour of the Allies. The initial attack of 21st March 1918 in the old Somme battlefield pushed the British back by 25 miles but it did not break the line. 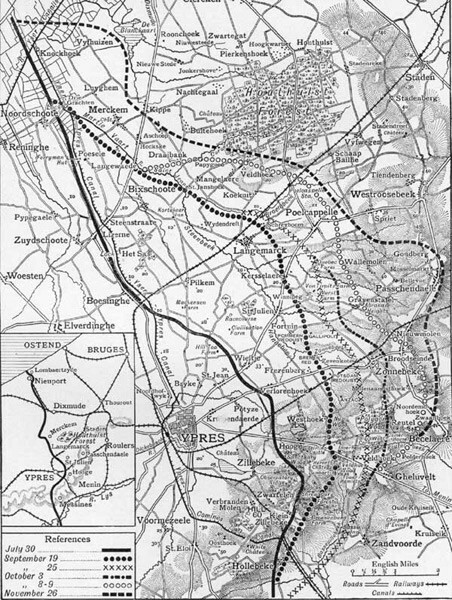 ( see the section of the website UNDER THE STORM OF STEEL ) On 9th April 1918 Ludendorff launched the second phase aimed at capturing the railway hub of Hazebrouck , the gateway to the channel ports. This was swiftly followed by an attack across the River Lys which ultimately resulted in the loss of all the ground gained in the 1917 Flanders offensive. Further attacks by the German storm troopers around Langemarck were driven off. At last Lloyd George relented and sent UK based reserves across the Channel to bolster the hard pressed BEF . Whilst the Germans drove the demoralised French off Mount Kemmel they could go no further , they were exhausted. The BEF had done a superb defensive job in holding ,retreating and holding again their positions . The boys, for many were only 18, of that great citizen army together with their kinsmen from the dominions of Canada. Australia, New Zealand, South Africa and Newfoundland had withstood the might of the German army . To paraphrase Churchill in WW2 , for the BEF the Battle of Ypres in April 1918 was its finest hour. My relatives played a full part in this heroic rearguard action as the War Diaries of their battalions tell us in great details. My grandfather’s extended Maltby family from Cambridge included many of his cousins . One was Arthur W Maltby who joined up in 1916 under the Derby scheme being part of Group 41 . He went to France in September 1916 and appeared destined to join the 10th Bn Essex Regiment , even having a regimental number 28251 but at the last minute he and others went to the 12th Bn Suffolk Regiment part of the 40th Division . His war was relatively quiet until his involvement in the Battle of Cambrai in November 1917 and then finding themselves right in the path of the storm troopers in March 1918. Exhausted, depleted and traumatised by their experiences, the survivors of the 40th Division were moved north to a front around Armentieres, which had been a quiet sector. British intelligence had not discovered the fact that the great German offensive of 1918 was made up of several components. Thus, on April 9th 1918 at 4.15 am, the enemy attacked in the very place to which the 40th Division had been sent, the River Lys. The 12th Suffolks were called from reserve to defend around Fleurbaix, where it put up a great defence, inflicting substantial casualties upon the waves of attacking Germans, until at 4.30 pm it fought a rearguard withdrawal. On 10th April it withdrew across the River Lys to Nieppe, where it dug in before withdrawing further west to be in front of the major railway terminal of Hazebrouk. Their war diary WO95/2616 provides the details of their defensive role . 9 15 am Marched to ST OMER to billets. "In this fighting very gallant service was rendered by the 12th Battalion Suffolk Regiment 40th Division who held out in Fleurbaix until the evening though heavily attacked on three sides." So ended the 12th Suffolk Battalion’s involvement in the German offensives, having lost 423 men from their ranks. Like other Divisions and Battalions, the 40th was understrength as the result of their defensive tasks of March and April 1918. The 12th Battalion was reduced to cadre in May, with 21 officers and 630 ORs being sent to base depot for redrafting. This was how Arthur found himself posted to the 2nd Battalion Northamptonshire Regiment for the remainder of the war. Whilst Arthur Maltby was doing his bit to hold back the Germans another of my grandfather’s cousins Samuel R D Maltby was fighting desperately to hold back the waves of storm troopers . Samuel had gone to France in August 1916 and had been drafted into 5th Bn Yorkshire Regiment with his cousin , my grand father’s older brother Frank Maltby . Frank was killed during the Battle of Arras during which Samuel was wounded. He returned to his unit in January 1918 and survived the March offensive during which the 5th Yorkshires and the rest of 50th Division covered the withdrawal of the BEF to the outskirts of Amien. The 50th (Nothumbrian) Division, which included the 5th Yorkshires and my grandfather’s cousin Samuel R D Maltby, having suffered during the St Michael offensive, had been moved to a quiet sector to the north of Bethune. The sector in which they found themselves was held by Portuguese troops, who fled, leaving a huge gap in the defensive lines when the Germans attacked on 9th April 1918.The 50th Division was tasked with plugging the gap and preventing the enemy from crossing the river Lys at ESTAIRES. Large bodies of the enemy attempted to press back the line but the battalions with fine tenacity stuck to their positions. The troops of 50th Division were mentioned in the official dispatches. "At Estaires the troops of the 50th Division tired, reduced in numbers by exceptionally heavy fighting of the previous three weeks and threatened on their right flank by the enemy’s advance south of the river Lys were heavily engaged. After holding their position with great gallantry during the morning they were slowly pressed back in the direction of Merville." At 9. 5. am the Green Howards reported that the enemy pressure on the front was great. Fighting hard, the Green Howards held on until practically surrounded. Many of them were captured and wounded owing to the impossibility of getting away. 9th 7 am placed under 1 hours notice to move. On arrival found ESTAIRES heavily shelled and main street impassable. 10th At about 11 am information was received that the enemy having crossed the R. LYS at BAC ST. MAUR was then occupying LA BOUDRELLE. Here the line held for the remainder of the day and all night. There was continuous rifle fire and heavy casualties were inflicted on the enemy. 11th In the early morning of this day the enemy attacked the left flank heavily The Middlesex on the left withdrew but the Coys holding the salient held on till practically surrounded and many were captured or left wounded, it being impossible to get away. When the line withdrew the Battn got badly scattered. At 1pm orders received to form a stragglers post to collect all men of 150th I. B. Men were collected and the 150th I.B. formed a Battn under Lt Col THOMSON though a very weak Battn. Orders from 150th I.B. received about 7 pm instructed force to hold on till darkness at all costs, and then if unable to hold to withdraw and move to VIERHOUCK where 50th Div were forming a line running towards MERVILLE. 12th The Battn was assembled and took up a position on the right of the GUARDS. In this position the mixed Battn held on until 4 pm . At about this hour some detached posts of the Guards were surrounded and had to surrender. This and constant MG fire and sniping started a withdrawal of the mixed men. 13th The Battn arrived here at 9 30 am where it was met by the transport and bivouacking, was fed and remained till 5 pm when it was ordered to occupy billets in the vicinity and remained the night. 14th The Brigade reorganized and each Battn formed a Coy the whole 150th Bgde. Battn. Under Col. THOMSON. 16th Battn. Moved to LA LACQUE, Div. now being in CORPS RESERVE. During this period 9th to 16th April the 5th Battalion had suffered 11 deaths, 126 wounded and 159 missing. During both German attacks it had suffered 698 casualties, so that during May it received a mass of new recruits to bring it up to strength. Samuel R.D. Maltby, aged 24, was now a veteran, having been in the battalion since August 1916. My maternal grand father, George Maltby of Cambridge, having been called up in March 1917, after a period with the 18th Training Bn., was posted to one of the oldest regiments in the British Army - the 1st Bn the Royal West Surreys, The Queen’s . On 11th April 1918, as part of the 19th Brigade 33rd Division, they found themselves in Brigade reserve around the town of Meteren, east of Hazebrouk, with orders to move at short notice and in fighting order, with each man having been issued with 220 rounds. By April 12th they were dug into positions south of the village of Meteren, ready to defend it against the waves of attacking storm troopers. Their war diary WO95/ 2422 provides a detailed description during 12th and 14th April 1918. The following is a synopsis of the main actions during this period as reported by Lt Col. Welch C.O. 1st Bn The Queen’s Regiment. 12th April On the night of 11/12th April , the Battalion was close billeted in huts at west end of METEREN . The village was shelled continuously during the night. The Battalion was held in readiness to move at very short notice. 1pm. Battalion to occupy a defensive position at once covering METEREN a distance of 3000 yards as 31st Division was reported to be retiring northwards in this direction. 1 45 pm The high ground that the Battalion was to occupy was found to be held by enemy machine guns. These inflicted very few casualties during the advance which was carried out in an extremely quick and efficient manner through some intricate and enclosed country. 3.0 pm The Battalion was now disposed on a frontage of 2100 yards. No touch had been gained on their flanks. The machine guns of 33rd Bn Machine Gun Corps were disposed in depth in and behind the Battalion’s front and throughout the operations rendered very valuable services. 5.0 pm “B” company reported enemy digging about 400 yards from their front and apparently being reinforced. 5 32 pm “C” company reported "About one company of enemy advancing on my right. Am killing them"
Enemy attacked in waves several times but was stopped without difficulty and suffered heavy casualties. 9.0 pm Enemy reported all along the front digging in in small posts. 11.0 pm Patrol sent out along the whole of the Battalion’s front encountered parties of enemy digging in on an average of 400 yards from our front. 12 35 am Message sent to Brigade HQ “ The holding of the front is made precarious owing to the enemy being in occupation of OUTTERSTEENE from which most of the line is enfiladed. I would suggest that as soon as troops become available , every effort should be made to secure this place and MERRIS. I do not consider that I have enough reserve to do this without support as it would greatly lengthen front. 5 30 am Morning very misty.”D” Company was attacked by two lines of enemy. Attack was driven off by rifle and L.G. fire. Following on this attack enemy under cover of very considerable artillery and machine gun fire made continual attempts to penetrate the line but were continually held up . Heavy casualties were inflicted upon them during these attempts. 8 45 am A heavy attack developed from the direction of OUTERSTEENE Three posts held by “B” company were overwhelmed. The occupants were reported missing. This necessitated the withdrawal of the remaining posts. 1.0 pm Withdrawal begun , under cover of fire of M G Corps and local covering fire. 4 30 pm Enemy under cover of fairly heavy shelling attacked posts along the line were driven back. During the afternoon there was considerable enemy movement all along the front. Several reports of enemy cavalry being in action. 7 30 pm Position of the centre of Battalion was found very unsatisfactory owing to enclosed country and enemy machine guns on high ground enfilading the whole of the Battalion’s front. It was therefore decided to withdraw centre and left of the Battalion. This operation being carried out without any difficulty. The withdrawal effectively covered by machine guns. 8 15 am Enemy began to mass opposite right of the Battalion and an attack developed but was stopped by machine gun and rifle fire. 12 15 pm Two platoons of 18th Bn Middlesex Rgt holding trenches having fired off most of their ammunition withdrew without warning and for no adequate reason. Orders were issued for the trench line to be re occupied at nightfall. This was done. Co operation between Boche infantry and gunners extraordinarily good. 4 30 pm Arrangements for the Battalion’s relief 14-15th. 3 45 am. Relief completed without incident. The battalion was concentrated in the NOOTE BOOM area and billeted in a farm. Personnal by bus, transport by road arrived and bivouacked 2 30 pm. 5th At 2 hours notice . stood to 7 am to 7 30 am in readiness to move into battle. 6th Battn remained in close support. 8th at 12 30 pm the Battalion was ordered to be ready to move at 10 minutes notice. At 3 15 pm orders were received for a counter attack to be delivered on the point penetrated by the enemy. The battalion moved at 5 30 pm & was in position at 7 15 pm . During counter attack shelling was very heavy on position held by the battalion. 9th The battalion moved in to relieve at 10 30 pm & relief was complete by 3 am . The battalion of the 32nd French Division on battalion right. They showed no inclination to advance . It was found impracticable to advance the battn’s line to any appreciable extent without their cooperation. 10th At 3 30 am the enemy heavily bombarded the Bn front the majority of the barrage falling over the front line. On 20th May 1918 the 19th Brigade of 33rd Division, including George Maltby and the 1st Bn Queen’s, were inspected by the Army Commander, General Sir Herbert C. O. Plumer. The Brigade was formed up in a hollow square at 11 30 am each of the three sides being a battalion in mass formation. Military Medals were presented to men of the battalion for distinguished conduct in the operations S of Meteren on 12/14th April. Gen. Plumer delivered a speech in which he congratulated the 33rd Division & the 19th Brigade upon the excellent work done at the critical time 12th / 16th April in the operations around BAILLEUL & METEREN. My paternal grandmother’s brother, George Shallish of Banwell, Somerset, joined up in 1917 at the age of 29, and was posted to the 4th Battalion Worcestershire Regiment, part of the 29th Division. In the early part of 1918, they were in the Ypres salient and on 9th April had been sent back to a camp some miles behind Poperinghe. However, they had only been in this camp for a few hours when they received orders to be ready to move to an unknown destination. On 10th April, they were moved off in London omnibuses towards Bailleul. As they passed down the Armentieres road, they met up with groups of stragglers, including the remnants of the Portuguese brigade that had broken ranks and fled in the face of the German bombardment. The 4th Battalion War Diary WO95/ 2309 provides details of this and the subsequent actions, written in a very matter of fact unemotional narrative - almost totally disguising the extremely serious nature of the situation at the time. 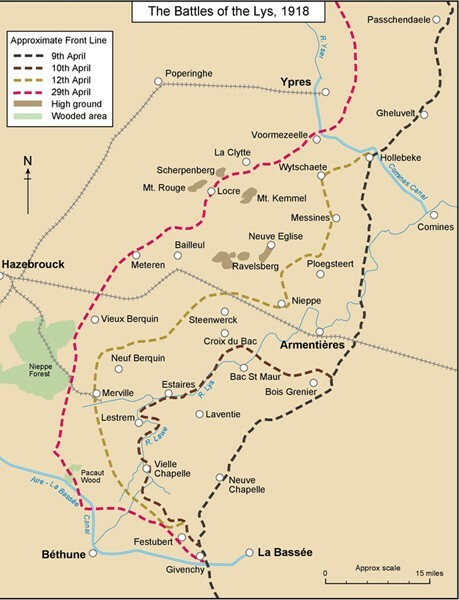 April 10th A few miles from BAILLEUL the convoy was stopped from proceeding any further in the direction of ARMENTIERES. We were informed that everyone was in full retreat and that there was nothing between us and the advancing enemy other than a few stragglers and refugees. Colonel Clarke in command of the convoy gave orders for all to disembark and sent the buses away. He decided to seize the village of LA CRECHE and the station and railway embankment to the south of it . The enemy were advancing in considerable strength towards the village and along the railway embankment and 4th Worcs were soon heavily engaged but managed to inflict severe loss on the enemy and reached their objectives. The fighting was severe at the station which changed hands three times during the day but eventually remained in possession of the 4/Worc. & 12th. and occasional raids endeavoured to penetrate our line. April.13th. During the morning of the 13th orders were received to withdrew to the Mont de Lille during the night. At , I believe , midnight the evacuation of our position commenced – this was carried out to such exactitude that not a shot was fired, and we were well consolidated in our new positions on the Mont de Lille just as dawn broke. April 14th. It was some time before the enemy was seen advancing towards us and this was done in a very clever manner, small parties of machine gunners making their way towards our new position down the hedges, and it was exceedingly difficult to watch them . Their tactics appeared to be to get machine gun detachments through the gaps in our lines and then fire on our troops from behind. They succeeded in doing this on our flank, which had rather a terrifying effect. We were successful in holding onto our position in spite of these continual raids until we were eventually relieved on the evening of April 15th. April 15th. This relief was most welcome , as neither officers nor men had had any sleep to speak of since we went into action on the 10th April. It was a great feat to hold up the enemy for a period of six days , which undoubtedly gave time for reorganization behind at a very critical time. After relief we marched back to a well equipped Nissen Hut Camp. No sooner had we decided to settle down when the Brigade Major informed us that the enemy had broken through the part of the line we had just left ( imagine our disappointment and even disgust when we heard this after we had held on for nearly a week) and that we were to go up and counter attack at dawn. April 16th. Fortunately, the situation was not so serious as was anticipated and we were successful in regaining the position on the Mont de Lille we had so recently left. I do not remember how long we remained there, I think only for the one day , when we were again relieved and once again settled down to trench warfare of rather a more open character in the Vieuve Bequin section. We remained here for some weeks , being periodically relieved and then were sent back to near Cassell where the Battalion was re-equipped and well rested. 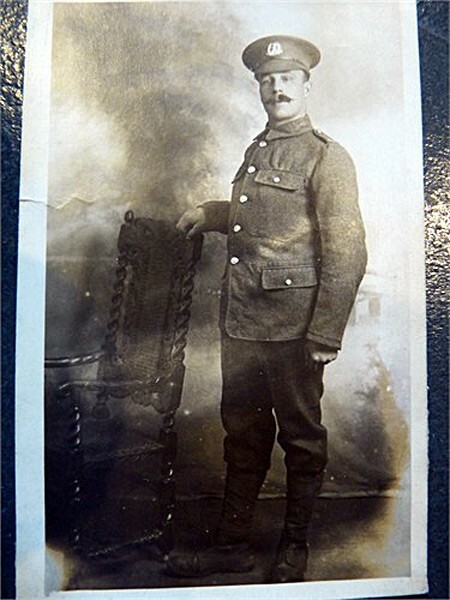 Private George Shallish of the 4th Bn Worcestershires, was one of these men who retired from the fighting, preparing themselves for the final actions of the Great War. My four relatives, who had fought in the Battle of the Lys, had luckily all survived to fight another day. The British Press heralded it as a German defeat, although the British had suffered severe losses, with some units being totally disabled. However, the Germans had made no real strategic gains and the territorial gains had extended their lines, thus requiring more men to protect them. If the Battle of the Lys had been won by the British, it was through personal bravery and a strong desire not to be beaten. Further German attacks in the Aisne in May 1918 were intially successful but failed to drive onto Paris as more and more Americans were available to help the French defend the outskirts of their capital. By September 1918, the tide had turned and Plumer returned from Italy swept the Germans out of the Ypres salient and channel ports. Political trouble at home and a lack of food knocked the stuffing out of the German army and so they agreed to an armistice which was signed in a railway carriage in the Compiegne forest on 11th November 1918. Belgians returned to their war battered country and slowly Ypres was rebuilt back to its mediaeval glory. 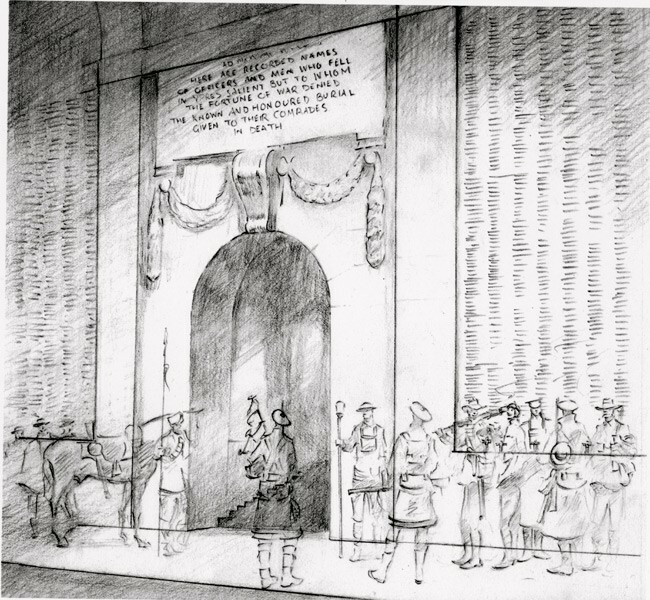 It soon became a place of pilgrimmage and the symbol of WW1 for the British who flock their to pay hommage to those young men of yester year who marched through the Menin Gate singing the songs we know so well. Some returned but thousands lie in beautifully kept GWGC cemeteries dotted across the Flanders plain or have their names etched in the Portland stone panels of the Menin Gate, Tyne Cot and Ploegsteert Memorials. 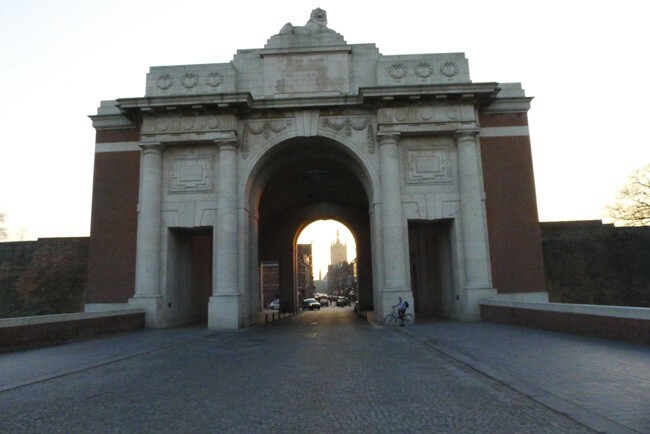 It is the Menin Gate which dominates the small town of Ypres today and nightly attracts hundreds to hear the Last Post played on the silver bugles of the Fire brigade. This they have been doing since the Gate was dedicated on 24th July 1927 by Lord Plumer. Before a crowd swelled by the ranks of the women of the missing Plumer said "He is not missing" and pointing to the thousands of names etched in gold letters on the great memorial arch behind him he continued "He is here"
As I write this , I myself am preparing for another visit to the Ypres battlefield. For us all it still has a powerful magnetic pull made more so by the approaching centenaries of the Second and Third Battles of Ypres and the new memorials to the various regiments who fought and died there. National Archives, Kew, London – Medal Index cards, Regimental Medal Rolls, War Diaries series WO95/2277,2266,2538,1817,2040,2430,2616,2836,2422,2309.